This is a full-size single urn and is designed to hold the cremains of a person having a total body weight of up to 212 pounds prior to cremation. 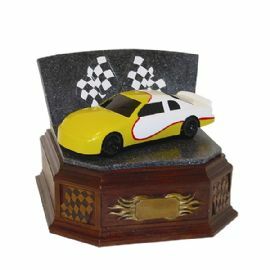 The Yellow Race Car statuary cremation urn is a fitting tribute to any automobile racing fan. This urn includes a blank nameplate.